A fairy created by Jim Fitzpatrick. Can you find it in Eyre Square? 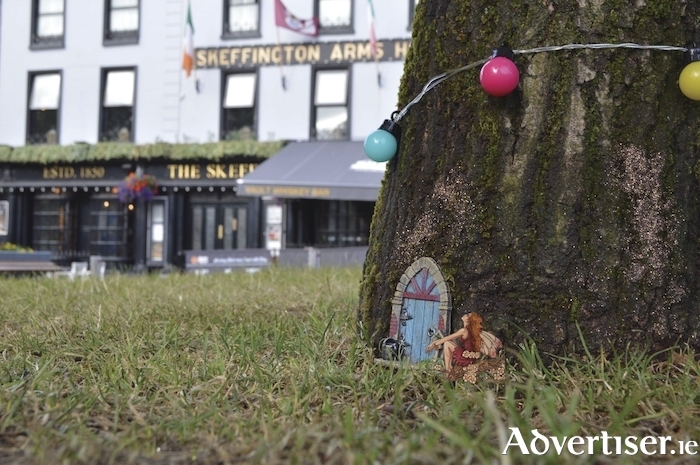 IF YOU and the children are around Eyre Square during the Galway International Arts Festival, you might happen to notice a series of tiny doorways on the trees around the square - they mark the places where fairies live. The Skeff Bar has organised for the fairy doors - there is even a fairy pub - to appear and is encouraging the public to take photos of them, using a special Snapchat filter. To access the filter you must snap when in Eyre Square and swipe across. The Skeff is also offering prizes for photos. The photos must be tagged in your Fairy snap on social media and use the hashtag #skefffairies. The Skeff's Snapchat is @theskeff. The idea is to mix "Celtic mythical magic and modern day technology". To this end, Irish artist Jim Fitzpatrick, best known for creating the iconic image of Che Guevara and for designing album covers for Thin Lizzy, has given permission for his image of a fairy to be used on the Skeff Snapchat filter.